We’ll provide some insights and review some of our DFS value players for week 12. Baker Mayfield (CLE) – Salaries: DraftKings (DK) – 5500, FanDuel (FD) – 7500. Mayfield’s upcoming salary ranks him 17th/14th on DK/FD, respectively for the position. Mayfield posted an efficient 17/20, 216, 3:0 line and 6-20-0 on the ground against Atlanta in week 10. Mayfield’s 22.64 fantasy points ranked him 9th/5th on DK/FD, respectively in week 10. The betting line with the Bengals lists the game total at 47.5 points with the Browns as +3 point road dogs. The Browns’ implied team total is currently at 22.25 points and the Bengals are currently at 25.25 points. The Browns are coming off their bye. The Bengals’ defense ranks 23rd against QBs in fantasy points allowed and 18th in DVOA against the pass. The Bengals also rank 31st in pass yards allowed with 295.8/gm and 31st in points allowed with 31.2/gm. In the past two games since Freddie Kitchens assumed play-calling duties, Mayfield has averaged just over 20 fantasy points. Mayfield gets a solid matchup this week. 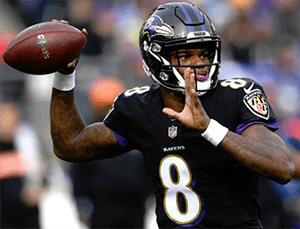 Lamar Jackson (BAL) – Salaries: DraftKings (DK) – 5700, FanDuel (FD) – 7400. Jackson’s upcoming salary ranks him 12th/17th on DK/FD, respectively for the position. Jackson posted a 13/19, 150, 0:1 line and 27-117-0 on the ground against the Bengals last week. Jackson’s fantasy points of 19.7/16.7 ranked him 9th/14th on DK/FD, respectively for the position. Jackson’s price per point efficiency ranked him 6th/12th on DK/FD, respectively. The betting line with the Raiders lists the game total at 42.5 points with the Ravens as -11 point home favorites. The Ravens’ implied team total is currently at 26.75 points and the Raiders are currently at 15.75 points. The Raiders’ defense give up the 12th most fantasy points allowed to QBs and 8th most to RBs. The Raiders’ defense also ranks last in DVOA against the pass and 25th against the run. The Raiders give up the 2nd most rushing yards with 142.3/gm, and the 3rd most points with 29.3/gm. The Raiders’ D-line ranks 27th in adjusted line yards while the Ravens’ O-line ranks 15th. If Joe Flacco (hip) remains sidelined throughout the week, Jackson will have his first full week of practice with the first team. Jackson was Baltimore’s fastest ball carrier last week having been clocked at 19.96 mph. Jackson’s rushing volume of last week may not be sustainable, but his ground game does bring a massive floor. The Raiders’ defense should have problems here if Jackson does get the start over Flacco this week. Jackson has been named the starter. Josh Adams (PHI) – Salaries: DraftKings (DK) – 3800, FanDuel (FD) – 5700. Adams’ upcoming salary ranks him 34th/31st on DK/FD, respectively for the position. Adams posted a 7-53-1 rush line and 3-19-0 on 6 targets with 28 snaps (55%) at New Orleans last week. Adams’ fantasy points of 16.2/14.7 ranked him 16th/15th on DK/FD, respectively for the position. Adams’ price per point efficiency ranked him 5th/7th on DK/FD, respectively. The betting line with the Giants lists the game total at 46 points with the Eagles as -6 point home favorites. The Eagles’ implied team total is currently at 26points and the Giants are currently at 20 points. The Giants’ defense ranks 25th against RBs in fantasy points allowed and 20th in DVOA against the run. The Giants also rank 25th in rush yards allowed with 125.4/gm and 24th (tied) in points allowed with 26.3/gm. 49ers’ RBs combined for a 27-123-1 rush line and 5-41-1 on 7 targets against the Giants in week 10. Adams hit a season-high with a 55% snap rate, leading all Eagle RBs. Corey Clement ranked 2nd with a 27% share. Adams out-touched all other Philly RBs combined 10 to 5. His role mostly dominated volume, despite the Eagles getting blown out early by the Saints. Adams was the lone offensive bright spot for the Eagles last week. The Philly RBs were scripted-out due to the blowout loss, but that shouldn’t be the case this week. Adams is clearly the best RB talent currently on this roster. His 6.1 YPC is 2 yards more than next highest, Clements. The Eagles (4-6) are seriously at risk of missing the playoffs if they lose this game. As home favorites in a great matchup, Adams’ breakout spot potential won’t get much better than this. Marlon Mack (IND) – Salaries: DraftKings (DK) – 5500, FanDuel (FD) – 7000. Mack’s upcoming salary ranks him 16th/14th on DK/FD, respectively. Mack posted a 16-61-1 rush line and 1-8-0 on 2 targets with 38 snaps (61%) against the Titans last week. Mack’s fantasy points of 13.9/13.4 ranked him 18th/17th on DK/FD, respectively for the position. The betting line with the Dolphins has the game total at 51 points with the Colts as -9 point home favorites. The Colts’ implied team total is currently at 30 points and the Dolphins are currently at 21 points. The Dolphins are coming off their bye. The Dolphins’ defense ranks 29th against RBs in fantasy points allowed and 21st in DVOA against the run. The Dolphins also rank 30th in rush yards allowed with 142/gm and 22nd in points allowed with 25.6/gm. The Colts O-line ranks 3rd in adjusted line yards while the Dolphins D-line ranks 17th. Aaron Jones posted a 15-145-2 line and 3-27-0 on 5 targets against the Dolphins in week 10. As big home favorites with a great matchup, Mack is in an optimal spot this week. Matt Breida (SF) – Salaries: DraftKings (DK) – 5700, FanDuel (FD) – 6400. Breida’s upcoming salary ranks him 14th/20th on DK/FD, respectively. Breida posted a 17-101-1 rush line and 3-31-1 on 4 targets with 44 snaps (60%) against the Giants in week 10. The betting line with the Bucs has the game total at 55 points with the 49ers as +3.5 point road dogs. The 49ers’ implied team total is currently at 25.75 points and the Bucs are currently at 29.25 points. The 49ers are coming off their bye. The Bucs’ defense ranks 30th against RBs in fantasy points allowed and 27th in DVOA against the run. The Bucs also rank 19th in rush yards allowed with 113.6/gm and last in points allowed with 32.9/gm. The 49ers O-line ranks 11th in adjusted line yards while the Bucs D-line ranks 10th. Saquon Barkley posted a 27-142-2 rush line and 2-10-1 on 3 targets against the Bucs last week. Breida’s 5.6 YPC ranks him 4th in the league. Breida faces an implied negative game-script but gets a great matchup this week. Marcell Ateman (OAK) – Salaries: DraftKings (DK) – 3100, FanDuel (FD) – 4800. Ateman’s upcoming salary ranks him 89th/85th on DK/FD, respectively for the position. Ateman posted a 4-50-0 line on 5 targets, and 65 snaps (96%) at Arizona last week. The betting line with the Ravens has the game total at 43 points with the Raiders as +10.5 point road dogs. The Raiders’ implied team total is currently at 16.25 points and the Ravens are currently at 26.75 points. The Ravens’ defense ranks 4th against WRs in fantasy points allowed and 12th in DVOA against the pass. The Ravens also rank 2nd in pass yards allowed with 205.4/gm and 1st in points allowed with 18.1/gm. The Bengals’ WRs combined for a 7-103-1 line on 19 targets at Baltimore last week. Brandon LaFell (Achilles) was placed on IR. Jordy, Martavis, and now LaFell are gone, leaving Seth Roberts and Ateman left on this roster. Ateman’s snap counts last week led all Oakland skill position players by far. Seth Roberts’ 47 snaps (69%) ranked 2nd on the team. As massive road dogs, Derek Carr will need to throw to someone, and often, as Carr’s target concentration has now boiled down to four players. The implied negative script should easily hold as the Ravens’ defense ranks 2nd in fantasy points allowed to RBs, 3rd in rush yards allowed, 5th in DVOA against the run, and 4th in adjusted line yards, so the Raiders’ RB committee can expect to often run into a brick wall whenever they try going there. The matchup is bad for Ateman and co., but he should necessarily see decent volume, if a bare-minimum punt play is needed this week. Jordy Nelson (knee) got in a limited practice on Wednesday. It’s possible he may play on Sunday. This scenario is becoming thinner all around. D.J. 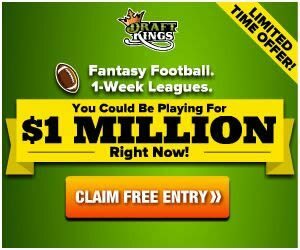 Moore (CAR) – Salaries: DraftKings (DK) – 4600, FanDuel (FD) – 5900. Moore’s upcoming salary ranks him 34th/34th on DK/FD, respectively for the position. Moore posted a 7-157-1 line on 8 targets and 45 snaps (78%) at Detroit last week. Moore’s fantasy points of 31.7/25.2 ranked him 6th/5th on DK/FD, respectively for the position. Moore’s price per point efficiency ranked him 3rd/4th on DK/FD, respectively. The betting line with Seahawks (5-5) lists the game total at 47.5 points with the Panthers (6-4) as -3.5 point home favorites. The Panthers’ implied team total is currently at 25.5 points and the Seahawks are currently at 22 points. The Seahawks’ defense ranks 16th against WRs in fantasy points allowed and 9th in DVOA against the pass. The Seahawks also rank 11th (tied) in pass yards allowed with 236.6/gm and 8th in points allowed with 21.6/gm. The Packers’ WRs combined for a 12-190-0 line on 19 targets at Seattle last week. The Panthers return home after two consecutive road losses and now find themselves in must-win territory as they vie for what is currently a wide open wildcard spot. Moore’s matchup isn’t great, but he should continue to see decent volume as he will be needed if the Panthers are to bounce back this week. Devin Funchess (back) missed practice all week and is likely out. Torrey Smith (knee) is listed as questionable but likely returns this week. The 49ers’ defense ranks 15th against TEs in fantasy points allowed and 22nd in DVOA against TEs. George Kittle logged a 9-83-0 line on 10 targets against the Giants in week 10..
O.J. Howard (ankle/foot) was placed on IR. Howard’s 60.8% snap share and his 11.7% target share now become available. Brate’s snap share should spike up, but this does not necessarily guarantee increased volume. There are a lot of mouths to feed as Tampa Bay goes four WRs deep and there’s Jacquizz Rodgers. Tampa Bay’s red zone TDs from their TEs come from Howard’s 4 and Brate’s 3. Brate will likely need to score to not bust, but he has a decent shot to do so. Jeff Heuerman (DEN) – Salaries: DraftKings (DK) – 3400, FanDuel (FD) – 5400. Heuerman’s upcoming salary ranks him 14th/17th on DK/FD, respectively for the position. Heuerman posted a 4-20-0 line on 5 targets against the Chargers last week. The betting line with the Steelers lists the game total at 46.5 with the Broncos as +3 point home dogs. The Broncos’ implied team total is currently at 21.75 points and the Steelers are currently at 24.75 points. The Steelers’ defense ranks 20th against TEs in fantasy points allowed and 27th in DVOA against TEs. Heuerman ranks 4th in red zone targets for TEs with 13, but he only has two TDs to show for it. Heuerman gets a strong matchup and should be implemented in the game-plan especially if the implied negative script holds.